President Trump is open to advice on whether to allow hunters to bring home elephant “trophies” for their walls and floors. The most famous elephant of all has some thoughts on the matter. Even in death, Jumbo The Elephant drew a lot of attention. For a few weeks recently, “The Greatest Showman” — the semi-true story of P.T. Barnum — was my daughter’s favorite movie. She’s moved onto “The Incredibles 2.” But, even now, I can’t get some of the tunes out of my head, thanks to her putting the movie on repeat for a week. Something other than the singing, dancing, and melodrama also grabbed my attention. 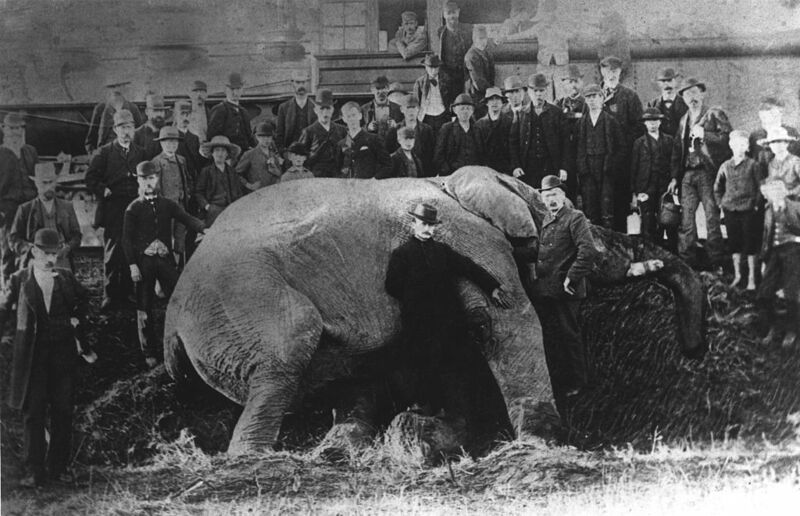 It was the cameo appearance of Jumbo, the world’s most famous elephant and one of Barnum’s signature displays. I’ve got a special connection to Jumbo The Elephant. As a freshman at Tufts University, I watched Jumbo’s skin and tusks go up in flames. His remains had been mounted in our school’s Barnum Hall, the first building that Tufts was contractually required to name after its donor. 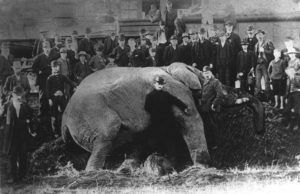 In a classic Barnum move, he donated Jumbo’s exterior, both for reasons of goodwill and to eternally remind the public that his circus would soon be back in town. For good luck in exams, it was a long-standing tradition to put pennies in the nostrils at the end of Jumbo’s trunk. But, thanks to an electrical fire, I never got a chance to add my two cents. However, in death, Jumbo was somewhat of a lucky elephant. He wasn’t the victim of a big game trophy hunter on an African safari. He wasn’t slaughtered by a poacher interested only in his tusks, leaving the rest of him to rot on the savannah. He was hit by a train in Ontario, Canada, at the the age of 25. His remains weren’t mounted on the wall or floor of some Hemingway-esque collector’s home or at an exclusive “explorers’ club”. His skin and tusks are now gone , except for some ashes now stored in a peanut butter jar in the office of Tufts’ athletics director. But his skeleton still stands tall at the American Museum of Natural History in New York City. His heart was sold to Cornell University. A lot of his descendants may not be so fortunate. If Jumbo could talk, he’d have a thing or two to say about the U.S. Fish & Wildlife Bureau’s announcement that hunters would be allowed to bring elephant “trophies” into the U.S. under certain circumstances. Skins of lions and bonteboks (an antelope relative), too. But the next week’s decision gave thumbs up to the president’s horror show. Paul Babaz, the president of the Safari Club (the leading pro-big game hunting group). Erica Rhoad, the National Rifle Association’s director of hunting policy. Bill Brewster, ex-Congressman and lobbyist and former member of the boards of directors of the Safari Club and the NRA. Gary Kania, vice-president of the Congressional Sportsmen’s Foundation, a leading hunting and fishing lobbying group. Olivia Nalos Opre, a judge on the TV show, “Extreme Huntress”, which is exactly what you imagine it to be, as well as a former Mrs. Nebraska. There’s nary a representative of an environmental or prominent animal welfare group to be found. I’m tempted to call this an example of the fox being put in charge of the henhouse. But that would understate the slyness and stealth of the proverbial fox in getting through the door. Secretary Zinke is being quite open about handing over the keys. “Recommend removal of barriers to the importation into the United States of legally hunted wildlife”. “Recommending methods for streamlining/expediting processing of import permits”. The IWCC met for the second time recently in Washington, DC. For the record, Babaz and his allies are correct in saying that a huge amount of the money spent by governments on wildlife conservation comes from hunters and anglers. (Most is raised via licensing fees and taxes on guns and ammo.) And some of the money spent on the hunt stays in local communities, which might otherwise engage in poaching or habitat-destroying land clearing. On balance, wildlife would be worse off without such funding. We don’t need to kill the elephant to save the elephant. There are plenty of other ways to provide the same amount of money, if not more. It will take dedicating funds from revenue from animal lovers (e.g. zoo-goers, national park visitors). It might require using general funds. And why not? Folks who never venture out of their hometowns benefit from the conservation of wildlife around the world. And it requires programs — private and public — that encourage alternative economic strategies for communities now dependent on big hunting: Bird-friendly “shade-grown” coffee. Responsible eco-tourism. Zero-deforestation growing of soybeans and palm oil. But the first thing it will take is a commitment to ending what the president called the “horror show” and a clear-eyed review of the facts on the ground. We’re not getting that now. And, unless President Trump heeds his earlier tweet and tells Secretary Zinke to reverse course (and there’s always a chance he’ll do so, if enough people raise a stink), it may be awhile before we get it. In the meantime, we need to think like Jumbo and, when our chance comes to make a difference, to never forget. Help encourage President Trump to stick to his belief that the “horror show” of trophy hunting won’t protect elephants. Sign this Environmental Action petition today.